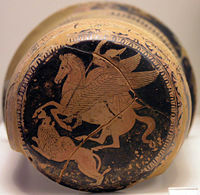 There have many images of horses with wings throughout the ages, but all come from the creature in Greek mythology known as Pegasus, or Πήγασος (Pégasos)) in Greek. Variations of stories involving winged horses do exist, but the legend of Pegasus and the tragic hero Bellerophon is the most prominent. In modern culture, Pegasus has come to refer to all winged horses, not only the one of Greek mythology who was transformed into the constellation of his name upon his death. Pegasus is generally not considered to have a physical existence. Greek poet, Hesiod connects the name Pegasos with the word for "spring” or "well," pēgē. Everywhere the winged horse struck hoof to earth, an inspiring spring burst forth: one on the Muses' Mount Helicon, at the behest of Poseidon, to prevent the mountain swelling too much and another at Troezen. The actual etymology of the name is most likely from Luwian pihassas "lightning", or pihassasas, a weather god (the god of lightning). In Hesiod, Pegasos is still associated with this original significance by carrying the thunderbolts for Zeus. Unlike some other mythical creatures, it is unlikely that Pegasus is based on a real animal of the time, or a misunderstanding of fossilized remains. 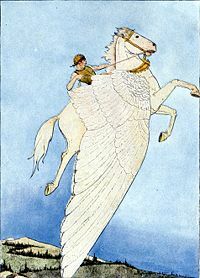 Rather, Pegasus seems to be an entirely fictitious creation, although horses were often central in mythology and cultures (including the unicorn). It is generally accepted that when Perseus beheaded the Gorgon (more popularly known today as Medusa) Pegasus sprang forth from her severed neck, keeping in accord with the idea of a "higher" birth, like the birth of Athena from the head of Zeus. The most common variant states that Pegasus was born of the earth as Medusa's blood spilled onto it and then into the sea foam. Since the God of the Sea, Poseidon is often said to be the father of Pegasus, this account seems more congruent than the other, although the nature of Greek mythology is often fragmented and often lacks a clear sense of continuity. Pegasus appears in the story of Bellerophon, the son of King Glaucus, a warrior known for his breeding of fierce horses who betrayed and devoured him. Bellerophon was rumored to come from divine parentage, but even if not, he was by far the strongest and most handsome young man in his kingdom. He desired to tame Pegasus and was shown a way by Athena after he slept in her temple one night; presenting him with a golden bridle, Bellerophon mastered Pegasus, and together the two had many adventures. It was because of Pegasus that Bellerophon was able to slay the Chimera, a fearsome conglomerate of a lion, goat, and serpent. Pegasus, not being immortal, was eventually turned into a constellation, but a single feather fell to the earth near the city of Tarsus, which is how the city earned its name. In modern times, Pegasus became applied to flying horses in general, wherever they appear in art or literature. Viewed as a symbol of the soul able to fly beyond the realm of physical life, Pegasus is an inspirational magical creature endowing a sense of beauty and majesty to the works in which he appears. 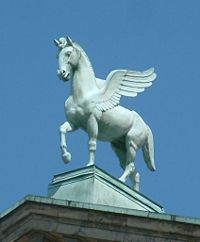 Pegasus has also been regarded as "the power of the creative spirit in all of us. He is the symbol of the Muses, of inspiration, and of the beauty we bring to our life and the lives of others." Of the mythical creatures represented in family crests and shields, Pegasus is not as predominant. However, there were some families known to bear the image of Pegasus, such as the Birchenshaw and the Cavalier families as well as Michael Drayton, the poet (1563-1631). 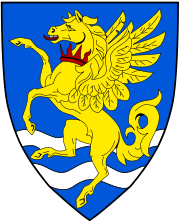 Pegasus also appears in heraldic fashion on a shield in Westminster Abbey. Most of Pegasus images in heraldry features the animal cantering or with its front legs raised in the air and infrequently in mid-flight. ↑ Ellie Crystal, "Pegasus" Ellie Crystal's Metaphysical and Science Website Retrieved March 21, 2007. All links retrieved February 3, 2019. "Pegasos" from Theoi Project, Guide to Greek Mythology. "Pegasus: The Flying Horse" Constellations of Words. This page was last modified on 3 February 2019, at 18:58.